I knew warm and kind people there. I had fun times there. Even the icky things left me with fond memories of there. We did have modern bathrooms, but the plumbing systems couldn’t handle toilet paper. Near each toilet was a receptacle for used toilet paper (ewww), which we emptied daily. While this grossed me out at the beginning — and even now as I remember — it quickly became our normal. It was very expensive to fill the household tank of kerosene that heated our water, so we did not leave the water heater on all the time like we do here in the US. Instead, an hour before we wanted to take a shower or wash dishes (by hand), we’d have to remember to turn on the heater switch. After we were finished, we’d have to remember to turn it off again. Again, this was burdensome and weird at first, but soon became normal. It was a teacher’s dream to teach Greek tragedies on stages of Roman ruins. 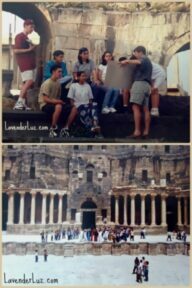 My husband teaching high school students a unit on Greek tragedies on a field trip to Bosra in southern Syria. Our school observed both Muslim and Christian holidays, which made for many long weekends and weeks off. We used that time to travel all over Syria and the region. 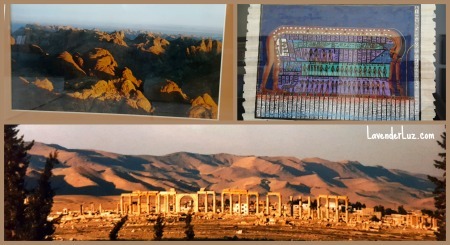 This is how we got to Palmyra (Syria) , Cappadocia (Turkey), Baalbek (Lebanon), Petra (Jordan), and Cairo (Egypt). View at dawn from the top of Mt Sinai. Papyrus of Goddess Nut. Palmyra in Syria before the destruction of war. One of the cool things about our school is that we could join with a bunch of fellow teachers and hire one of our school bus drivers and a school bus to take us on a trip. He’d also be our interpreter and make-things-happener. He’d help us find a suitable hotel, and take us to the places the locals recommended for meals. It was idyllic. There were no supermarkets as we know them. There were streets that were designated as market areas. Go here for your chicken. Next door you can get your canned foods. Cross the street for the milk and cheese man. Fruits and vegetables are two doors down, past the egg lady. And if you need beef, the best place is around the corner. We got used to seeing slabs of lamb hanging with flies buzzing around the flesh. It became normal to experience what most of humans throughout history have experienced in procuring their food. If we were game to leave our suburb and drive into downtown Aleppo, we might go instead to the souk. The Aleppo souk was burned in 2012. This image is of the Damascus souk. 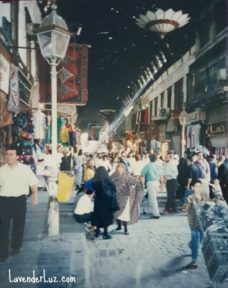 The souk was a feast for the senses — we’d see every color imaginable in fabrics and clothing and spices; hear a cacophony of seller banter; taste exotic teas when invited by a shop owner; smell coffee, and perfumes, and the iron odor of blood running in the gutters of the meat section. It was here we got a few carpets, a gold chain, and some handcrafted copper pieces we use as a coffee table. 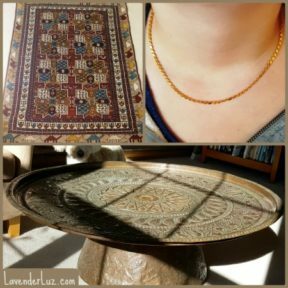 A carpet, a gold necklace, and two pieces of copper metalwork All finds at souks in Syria. About every month or two, we’d plan a Big Shop, in which we’d have to cross a border to get to a real department store or specialty grocery store. We’d pile into our company-issued Volvo and go north into Gaziantep, Turkey or west into Beirut, Lebanon. It’s weird now to think of driving a few hours and crossing a border just to get a Thanksgiving turkey and all the fixings and a box of Golden Grahams. But back then it was all an adventure. We’d make a day of it with fellow expats from Canada, England, the US. Our passports got quite a workout. We ate with the seasons. When figs were in season, we feasted on figs. So juicy and yummy! Same with melons, bananas, tomatoes, all other produce, and for those without a nut allergy, pistachios. My husband loved those. The Latin name for them is fustou Ḥalabī. — pistachios of Aleppo. When things weren’t in season, we didn’t eat them. Or we had to go on a Big Shop to find them. Thanks to social media, I still keep in touch with many of my friends and former students. The other expats have spread worldwide, going on to additional adventures and destinations. 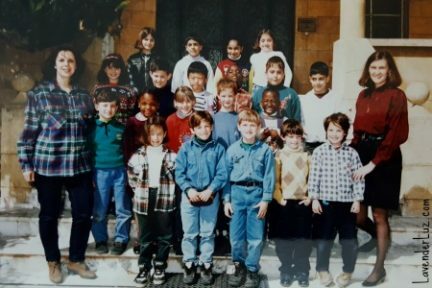 My first year at the International School of Aleppo I taught Grade 2. I know the status of some of these kids. But not all of these kids. Many of our Syrian friends had the means and desire to flee the conflict. They resettled in other countries in the Middle East, in the US, Canada, Europe. Many have stayed in Aleppo, living amid the ruins of their formerly majestic city, navigating fear, chaos, uncertainty, starvation, and lacking of basic things like drinkable water, medical care, and reliable electricity. We know of some who have died. That will never feel normal. This post is part of #MicroblogMondays (though I acknowledge this one is not so micro). Whazzat? A post that’s not too long. Head to Stirrup Queens to join the fun. Amazing and heartbreaking, all at the same time. Wow! Those are some memories and thank you for sharing. Sometimes what looks like a hardship is an experience with a loved one. Looking back, I am sure you look at those days with love. These are amazing memories. Which must certainly add to the pain of seeing this region torn apart. My hope is that there is peace soon and that the beauty that has been covered by human greed will return. Thank you for this. What amazing memories, and excellent writing. I can almost hear the noise of the flies in the market. This is wonderful. You are wonderful. My heart breaks for the refugees. You are making the world a little smaller today, Lori and I’m sure many people will learn something. Lesson #1 here for me: actual human beings are being bombed. War is hell. What beautiful memories, what a beautiful place. And so heartbreaking that it is under siege. I can’t imagine what it must feel like to see the places you were on the news, or worry about or grieve for the children you taught. I think it’s important to know what it was before, and what it is now, and to put faces and places to the Syrian refugees that people are so willing to talk about as a faceless group, instead of a people fleeing horrors (I just did a mini unit on the refugees and the situation in Aleppo as too few don’t understand the realities of life there but are all too willing to fear the people seeking sanctuary). I’m glad for your memories, and sad for your losses and the losses of those you knew. What an amazing experience! It’s so heartbreaking what’s going on there now. I’m glad you have those memories and shared them with us. I hope there’s peace in Aleppo soon. Thank you for making this nation three dimensional for us, Lori. May there be peace for us all … and may we be its brokers, rather than its executioners. Wow! What an amazing masterpiece! I couldn’t have done a better job. You are truly a loyal and unforgettable friend. Love you my twin! I’m glad that you got to have such a rich cultural experience there. Thank you for sharing. Thanks for sharing and making a place I only know through current reports of conflict real. So glad you shared this with us, Lori. Sometimes it’s hard to relate to these far-away places and the things they are going through. But I believe they are people like us, with families like ours, and the bottom line is we are really not so very different. 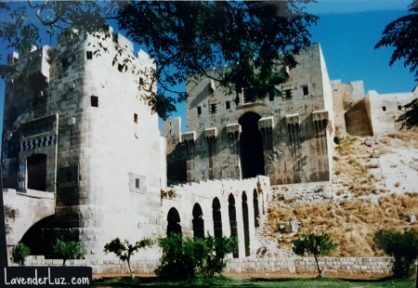 I am glad you know the Aleppo, as it was, before the war. What is now filtering out of that is cruel, and horrendous. I still think of Aylan Kurdi almost every day. They bombed a kindergarten school, hospitals, homes. I saw this video where the nurse was carrying out a baby of few days old out from a bombed NICU, crying and hugging the baby. I can’t believe what we want to do to this world. I love figs, and pistachios not so much. Where are we heading really…. Thanks for sharing this — I’ve never read about Aleppo from a first-hand account. What a wonderful adventure! And, so helpful to think about Aleppo in this way. Nice to hear that memories about our loved city. Thank you for sharing that, and hope that our city will be OK soon, and come back to its brilliance and magic.